﻿ Should You Use eBay to Sell Gold? Should You Use eBay to Sell Gold? In today’s economy, it’s evident that the world has shrunk simply because of the possibilities of shopping online. We can order a book from Amazon’s extensive collection and track the package as it moves thousands of miles from Kentucky to our doorstep. We can e-mail friends and family states or even countries away in an instant. With this kind of communication available and access spread worldwide, it’s no wonder that one of mankind’s oldest valuables, gold, is still a highly sought commodity on the Web. As such, it can be a valuable tool to utilize as an investment, to leverage in a sale, or even the medium in an over-the-web scam that looks to take advantage of some people. On eBay, the gold trading market is alive and well, just as it is with other markets online. How could it not be? Millions of people visit eBay on a regular basis, and the sheer volume of products, supplies, and bids taking place have forged eBay into its own mini-economy. If you’ve got gold to sell, you’ve probably thought about the different ways to go about selling gold. If you haven’t thought about eBay as an option, it’s time to put your assumptions aside and see what really goes on when you try to sell gold on eBay. 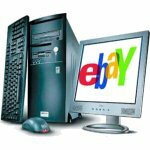 Since this article poses the question should you use eBay to sell gold, we’ll glance at the advantages and disadvantages of selling gold through an online megastore like eBay.com. Advantage: Volume of trade. Without a doubt, eBay is “the” place to head for buying and selling products on the cheap online. The privately-based system allows users to create individual pages for each product, which will then appear in eBay’s search results, gathering the necessary influx of interested parties to the product page. Not everyone will place bids, but with enough traffic, it’s inevitable you eventually find something. Why? Because there are so many people using eBay. You probably won’t have trouble finding someone interesting in buying something as valuable as gold. Disadvantage: Starting from scratch. EBay has a handy “user reputation” service that allows the people you have previously worked with on eBay to leave comments on your profile. This acts as an informal “resume” that advertises your competence or lack thereof to potential buyers and sellers. So why is this a disadvantage? If you’re starting with nothing, you haven’t had a lot of time to generate trust in people, even if your intentions are purely honest. Your resume will be thin for a while, and no one will have an idea if you’re someone who really delivers on what they promise or not. Advantage: Competition. With enough traffic (see the first advantage), you’ll have bidders trying to out-do each other in a battle for your product. Granted, this process means you’ll have to have people interested in the first place, but when you’re selling gold online, this competition can only help you. Sometimes, runaway bidding takes place, in which two or more parties try to one-up each other until the prices has grown perhaps above even market value. As the seller, this is good news for you as long as you can deliver the goods. Disadvantage: Inconsistency. Though eBay has a high rate of traffic, there’s no predictability with a bidding system. Someone looking for a consistent price to their gold might be turned off by the prospect of low bids and accepting a transaction that you didn’t want to get into from the start. Inconsistency means that there will be peaks as well as valleys in your experience on eBay, but if you’re someone who likes to avoid both peaks and valleys and unpredictability, there are other options available to you. You could take your gold to a metal broker who will be able to pay you an amount that approximates the current prices on the market. You might not receive top dollar this way, but a consistent paycheck for a gold seller can also be an enticing thought. Keep in mind that eBay is just another tool that gold sellers can leverage into getting the best prices for their gold. It does not have to be an end-all, be-all system that consumes all of your time, but if you are looking to really succeed with eBay, there might be livings to be made, as well. Ultimately, the choice of using eBay will be determined by you, and what you get out of it will depend on what you put into it. When Should You Sell Your Gold? Why Rich People Sell Platinum?